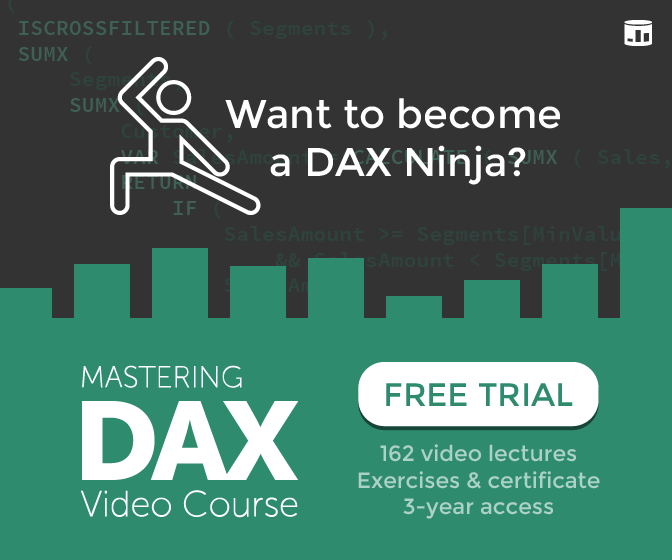 Data Analysis Expressions (DAX) is a formula language introduced by Microsoft in Power BI, Power Pivot and Analysis Services Tabular to define calculations and queries. The service is provided “as is” without warranty of any kind. The query you write are sent to a server running on Windows Azure, which provide a service for syntax formatting. A few results of the query parser can be saved for statistical reasons (most used functions, complexity index, average length and others). The DAX Formatter rebuild the DAX query code based on the syntax tree and the result might not correspond to the original query. DAX Formatter is not working as expected? Please, fill out the form as completely as possible. Note: the current formula will be automatically attached to the request. Added support to new functions: ALLCROSSFILTERED, ISSELECTEDMEASURE, CONTAINSSTRING, CONTAINSSTRINGEXACT, DISTINCTCOUNTNOBLANK. Added support to ALL() without arguments. The ROW function was not formatted properly going to a new line for the first argument. The indentation line was not present when the first element of a line was not a keyword or a function – only on www.daxformatter.com web site. 2006-2019 © SQLBI. All rights are reserved. Loader is the legal entity of SQLBI in Europe.